Delicious meals in a warm setting at Cafe Roma. On the outskirts of the city sits a little family restaurant that has been quietly serving up delicious meals in a warm and welcoming atmosphere for over three decades. And owners Sean and Jean Beatty certainly aren't planning to change their successful recipe anytime soon. "People like it here. It's a comfortable place to come and relax at the end of the day." said Chef Sean, who relocated to New Bedford from New York with his family 13 years ago when he and his wife purchased Cafe Roma from its previous long-term owner. "Some family members from the area called to tell us that there was this great opportunity to take over a restaurant, "recalled Chef Sean, who studied hotel management in college and brought an extensive background working in restaurants around the country to the table of the family's new venture. "So we quit our jobs and took a chance. We've never regretted it." While Cafe Roma may tout itself as a purveyor of Italian-American cuisine, the menu reaches far beyond pizza and pasta. Sirloin tips and fresh seafood are offered right along with homemade lasagna and baked ziti. "It's good, home-style food. People know that they can expect good quality when they come here"
Cafe Roma is know for its tasty thin-crust pizza, and its longstanding "buy two, get one free" pizza deal on Monday, Tuesday and Wednesday is legendary. Available toppings include everything from linguica and garlic to buffalo chicken and eggplant. An array of salads and grinders are also available for quick meal options. 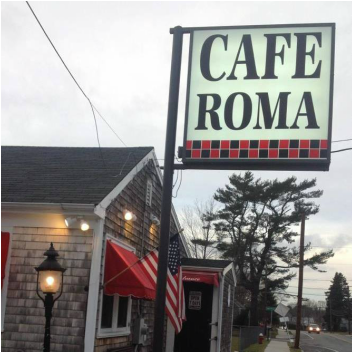 If you arrive at Cafe Roma hungry, then you've certainly come to the right place. Generous dinners include bourbon sirloin tips with onions, crispy chicken alfredo over ziti, baked ham and fish and chips. Chef Sean also puts his culinary creativity to good use in crafting specials like the pan seared scallops. "I like to try to put something a little different out there". Monday through Thursday from 4 to 6 pm, budget-consious diners can also take advantage of the "two dinners for $19.99" special. In addition to the cozy dining room, Cafe Roma also has a spacious bar area where patrons can relax and enjoy a cocktail during the game. Half-price appetizers at the bar and throughout the entire restaurant are also a popular draw on Wednesday evenings. While the food is certainly a big part of Cafe Roma's longstanding success, the Beatty's are quick to point out that the dedicated staff, some who have been with the restaurant for decades, is also a key ingredient.